North Korea has one-upped President Donald Trump’s infamous diet Coke button—the one he uses to ensure he gets his reported 12 cans a day—by providing Kim Jong Un with a similar button that can launch nukes at anywhere in the U.S. on his desk. At least, that’s if you take his word for it. However, the button is unimportant compared to the meat of Kim’s claims: That the North Korean government is past the development phase of its nuclear program and is prepared to mass-produce missiles. While North Korea is confirmed to have nuclear weapons as well as medium-range ballistic missiles, it’s not clear whether their long-range missiles yet possess the sophisticated guidance and re-entry systems necessary to carry out a successful intercontinental strike—though it’s likely only a matter of time. The U.S. military and its allies have only limited options to avert such an attack after a missile has been launched, even if the target is considerably closer to North Korea than the lower 48 states, like Japan, Hawaii or bases in Guam. 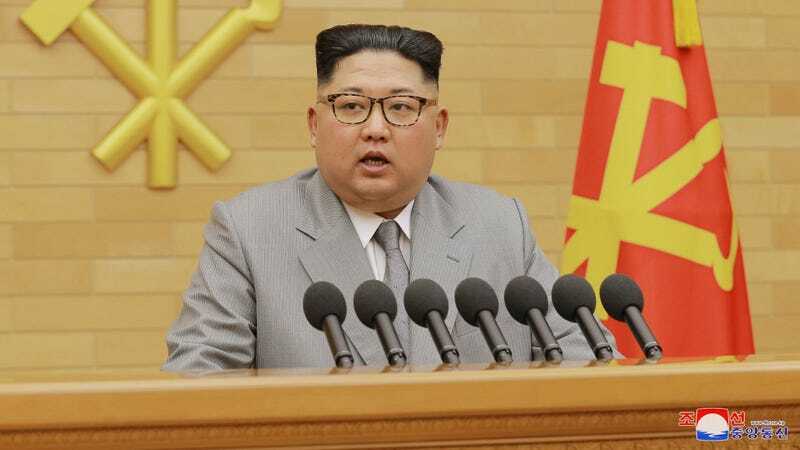 As the Post noted, though, Kim seemed to relax somewhat in his rhetoric after touting his much-expanded nuclear capabilities, mentioning the possibility of sending a North Korean delegation to the Winter Olympics in Pyeong­chang, South Korea. While an actual improvement in relations between the North and South Korean governments is unlikely, that could be taken as a small hint that now that he has them, Kim is more interested in the weapons’ deterrent effect rather than actually starting World War III. Fingers crossed.